The below account is mainly for mantra-theorists and practitioners in the circle but certain points might interest others who are in the know. Certain things will left unstated, which can be understood “between the lines” by such sAdhaka-s. While the practice under discussion is a nAstika one its deeper links will not be lost to Astika mantravAdin-s. The worship of AkAshagarbha is specified in the charyA layer of the tAthAgata tantra-s. Its practice belongs to the texts of the mahAvairochanAbhisaMbodhi tantraM family. This class of texts was transmitted to the chIna-s by the tAntrika-s (vajrabodhi of kA~NchIpuraM and amoghavajra) who journeyed to the Tang court to perform rituals for the emperors. From there it was transmitted to Japan. In 717 CE, the illustrious kShatriya mantravAdin shubhakara-siMha revealed to the chIna-s a new mantra-vidhi for AkAshagarbha that was supposed to confer the siddhi of extraordinary hearing, memory and vision on to the sAdhaka. In 718 CE a Japanese mantra-sAdhaka, Doji, obtained dIkSha in this vidhi directly from shubhakara-siMha (whose portrait is preserved in Japan) and transmitted it to the island. In around 796 CE the Japanese genius kUkai learned the vidhi from a mantravAdin and became an ubasoku (Skt: upAsaka) of this mantra practice. He assiduously practiced this in isolation on the Pacific coast by scaling the cliff of Mount tairyU in awa and the cape of muroto in tosa. 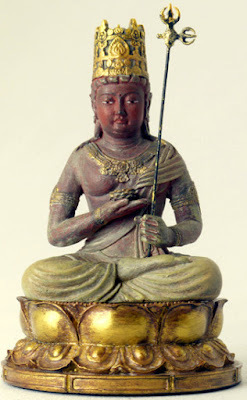 As result he is supposed to have attained the remarkable vision of AkAshagarbha that eventually led him to found the shingon tradition in Japan and eventually compose an enormous tAntrika work titled “himitisu mandara jUjUshinron” (Ten abiding stages of the mind according to the secret maNDala-s). Those familiar with Japanese mantra tradition inform us that this a very well-developed paddhati for mantra practice. Not surprisingly, this vidhi of AkAshagarbha, known to the Japanese as the “kokUzO bosatu nOman shogan saishOshin dhAraNI gumonji hO”, which is a close translation of the Chinese translation produced by shubharakara-siMha in 717, has an important place in their tAntrika practice. An interesting point to note is that the Japanese have changed some of the original instructions to shubhakara-siMha’s vidhi in order suit their practice. This illustrates how rituals change as they are adapted by new practitioners in different settings. In shubhakara-siMha’s instruction the sAdhaka used a sealed vial of milk symbolizing the “amR^ita” of mantra-siddhi. After performance of the akAshagarbha-vidhi the milk vial was opened and the way in which the milk had fermented was used to indicate the degree of success of the sAdhana. In Japan as milk was not commonly known due the lactose-intolerance of the Easterners this process was omitted. The original vidhi also specified the use of a sphaTika mAlA, but the Japanese found that to heavy to use and replaced it with a mAlA made from the wood of the beautiful Torreya nucifera pine. The original Indian version of the rite was performed at a more relaxed pace with 10800 repetitions of the mantra every day for 100 days, with daily japa sessions of about 5 hours, reaching a count of 1080000 at the end. The Japanese practice is half that with 21600 repetitions per day in two sessions totaling to 10 hours. This practice is typically initiated by the sAdhaka at the brahma muhUrta (~3.00 AM) while he has withdrawn into isolation.The practitioner also limits his salt intake before the performance and during the performance does not eat after noon. Thus, this kind of sAdhana cannot be undertaken by any one except those in best physical condition. The ritual hall itself is open so that the sAdhaka can glimpse the stars. On the eastern side there is a wall with an opening in the middle to see the the stars and the eastern horizon (this is the reason we hear of kUkai performing it high in the mountains). On the wall a picture of AkAshagarbha is hung which is covered by a white cloth except at the time of the sAdhana. Immediately below the painting, a maNDala of AkAshagarbha, along with the rest of the pantheon of the mahAvairochanAbhisaMbodhi texts, carved in wood, specified in the paddhati of shubhakara siMha is kept on an wooden four-legged stool. An oil lamp is placed in front of it which is keep burning through the rite. In Japan such meditation halls exist in a few places, including at a temple at the original place where kUkai had performed his sAdhana. The core of the sAdhana involves the meditation of AkAshagarbha in the disc of the planet Venus even as it seen above the eastern horizon. The right is done such that the last day corresponds to a solar or lunar eclipse with the number of days of sAdhana counted backwards. The practice itself begins with a pUja of AkAshagarbha in Venus just before it rises in the East. Then he draws two pails of water for ritual use. With water from one of the buckets he performs Achamana with the purificatory visualization. Then he prepares the offerings and enters the ritual arena wearing a white mask over his nose and mouth. In the hall he bows to the image of AkAshagarbha and lifts the white screen with a special stick while seated in the svastikAsana. Thereafter, he performs pa~nchA~Nga nyAsa while visualize being absorbed by AkAshagarbha followed by the other deities of the maNDala. Then he utters a mantra on the water and sprinkles it over the maNDala and the floor. Then he displays dhUpa and invokes a kavacha of the maNDala deities. Thereafter, he meditates on his unity with AkAshagarbha as depicted in the image and invokes the deity into the maNDala. Then he uses the ritual water specified for the deity to wash his feet, rings the bell and makes the five-fold offerings. He worships the tathAgata-s thereafter and performs a sarvA~Nga nyAsa and digbandha. This done he gets into the core ritual visualizing AkAshagarbha in the rising Venus, while doing japa with his akShamAla. He conceives a white disc on the chest of the deity in which the arNa-s of the mantra appear. He meditates on the mantra thus flowing from the deity emitting a golden hue and entering himself through the crown of his head, exiting via his mouth and reentering the deity via his feet. This cycle is kept throughout the ritual. However, in the last round the he performs the dharmadhAtu pravesha meditation in which he conceives the white disk with the mantrArNa-s expanding to occupy the entire universe and then contracting back to the original size. After this he concludes the ritual with the with the initial maNDala vidhi and the japa of the mantra of mahAvairochana and the other primary deities of the maNDala. Then after stuti-s and stotra-s he performs the digvimochana and upasthAna of the deity. taikO yamasaki’s first person account of the ritual gives some important points: He mentions that early in his sAdhana he suffered from physical pain in the legs and back that eventually gave way to a tranquil clarity. He also experienced non-dual consciousness, and described this experience in no different terms than the various sAdhaka-s who have been there before. He also mentions intense hallucinatory experiences that he states could have shaken anyone with a weaker physique or mental constitution. He mentions a vivid vision in which a mantravAdin appeared and offered him a secret mudra, but he did not get distracted as that could have completely ruined his sAdhana. Interestingly, he notes that shubhakarasiMha had a similar experience while performing this sAdhana in which he was tempted with a mantra for invisibility. This is what is implied in certain tAntrika texts which talk of siddhi-s which can distract as also in the classical yoga tradition. At the end yamasaki attained siddhi from his sAdhana as mentioned in the texts of his tradition. 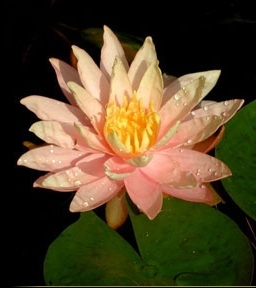 Where he is perceived as having a lotus garden or lotus diadem. This is consistent with taikO yamasaki’s interpretation of the mantra. It is possible that the conversion of Astika-s to the nAstika fold in bhArata led to reinterpretation of it using more familiar shaiva epithets or that originally shaiva epithets were reinterpreted in a nAstika form. A mantra-theorist might ponder upon how a grossly mispronounced mantra might still confer siddhi upon a prAchya sAdhaka. This entry was posted in Heathen thought, History and tagged AkAshagarbha, amoghavajra, bauddha, maNDala, mantra, Shingon, shubhkarasiMha, Taiko Yamasaki, vajrabodhi, Venus. Bookmark the permalink.